The Bundy Run starts and finishes in the heart of Bundanoon village, and sends runners through Morton National Park. Each distance is designed to test skill and endurance with 185m, 400m and 800m climbs in the Teaser, Quarter and Half Marathons respectively. All race routes cover a variety of bitumen road, narrow, uneven trails, stairs, and fire roads. Some surfaces are rocky and slippery. The Bundy Run is certainly a technical trail run (although much less so for The Teaser event). Care needs to be taken at all times to ensure a secure footing. 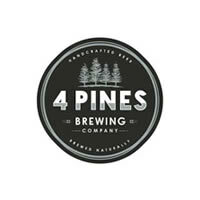 All distances see runners return to where they started, racing through the finishing arch to the cheers of spectators on the sideline, and a well earned 4 Pines Beer as a reward. 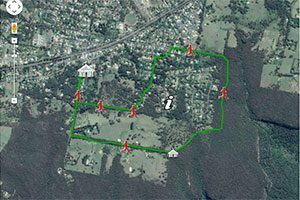 The Bundy Run starts and finishes on Church Street in the heart of Bundanoon. Heading down the aptly named ‘Constitution Hill’ from the start line, those thinking to the end of their race can assess what reserves they will need to get back up…but that is all in the future. Before getting to the bottom of Constitution Hill runners take a turn and head for the Governors Lane trail winding through forest. After heading through some very quiet residential streets and giving a friendly wave to locals, runners will encounter their first challenge: The Glow Worm Glen steps. Going down the steps takes runners away from town and into Morton National Park. Dropping some 50m in 500m, some knees may protest the early compression. Taking a right turn just before the historic Glow Worm Glen itself, runners will duck under an ancient tree, skip across a small creek and begin to wind along the Glow Worm Glen trail. Runners will hopefully be finding their stride and chewing through some distance. 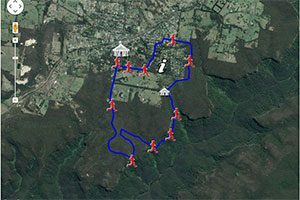 After joining Riverview Road, a dirt track, the rest of the field will soon bid farewell to The Teaser runners and head toward the cliff lines for their first glimpses of the Bundanoon Gullies. Following a steady downhill grade including steps and a walkway cut into the cliff itself, the optimists will be rejoicing in the kilometres clicking over; the pessimists wondering when things will start to go up. The answer is ‘not yet’ as runners get to pass down through the stunning Amphitheatre rock formations on their way to Nicholas Pass. Runners will be under no illusions now that they are in rugged country. 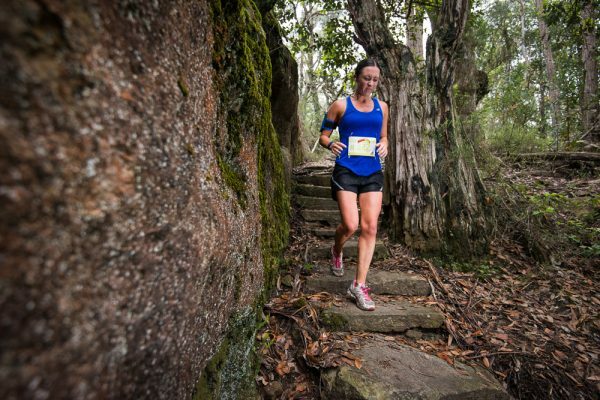 The undulating trail will compete with the views for the eyes attention as runners cross streams, rocks and narrow ledge tracks. Now, finally, what goes down must come up. 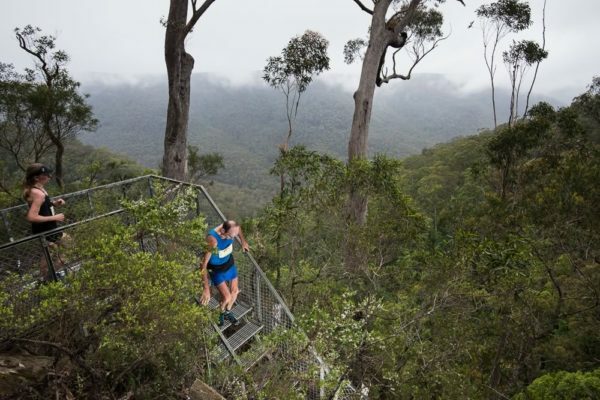 The stairs and metal walkway to the top of Fairy Bower will challenge runners to find a rhythm and steady pace to ascend back up the escarpment. While only 40m high, the uneven and sometimes large stairs at about the half way mark will test the endurance of all. Having climbed through the cliffline and again taken in some stunning views, runners begin the steady climb back to the plateau. Back onto the fire roads it’s time to put the hammer down and gun for home. The road winds around a couple more lookouts and then turns its back on the gorges and heads for town. Rejoining The Teaser course, those watching their GPS will catch a sniff of home and be spurred on. For those that remember the descent at the start of the race, trepidation will set in as Constitution Hill looms. At a 10-12% gradient, The Hill will take its toll, but the crowds should spur you on to the finish line at the top. Spare a thought for those doing the Half Marathon distance, they get to do it all again, running through the finish arch and continuing on for another fine and fun lap. Click the above map for an interactive map of the Half Marathon course. Click the above map for an interactive map of the Quarter Marathon course. Click the above map for an interactive map of The Teaser. Drink – Water and GU Brew will be available at the hydration station at the Start/Finish line for Half Marathon runners only. Half Marathon runners are able to drop their own supplies at this location, but do so at their own risk. 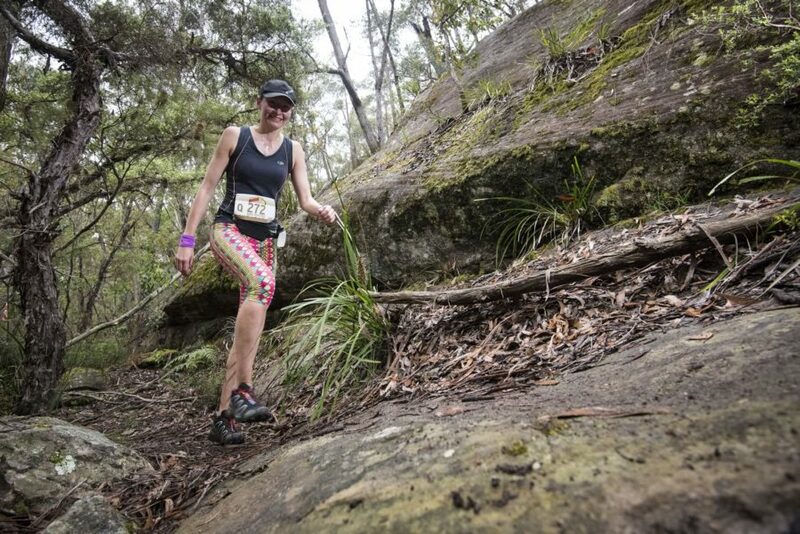 Food & Drink – A food and hydration station will be set up at the top of the climb out of Fairy Bower (approx 7km into the Quarter Marathon, 7km and 18km into the Half Marathon). Half Marathon runners will pass this feed station twice. There is no drop off service for this station. Runner support people are unable to access and offer support at this station. Note that the Bundy Run is a Bottled Water Free event. No bottled water is available to purchase at the event or in Bundanoon and we would encourage all participants to support this initiative and make other arrangements. There are public water fountains in Bundanoon and many shops have chilled water dispensers. Equally, no paper cups are available at the water stations as part of our waste reduction efforts. You will need to carry your own bottle or receptacle to fill up.